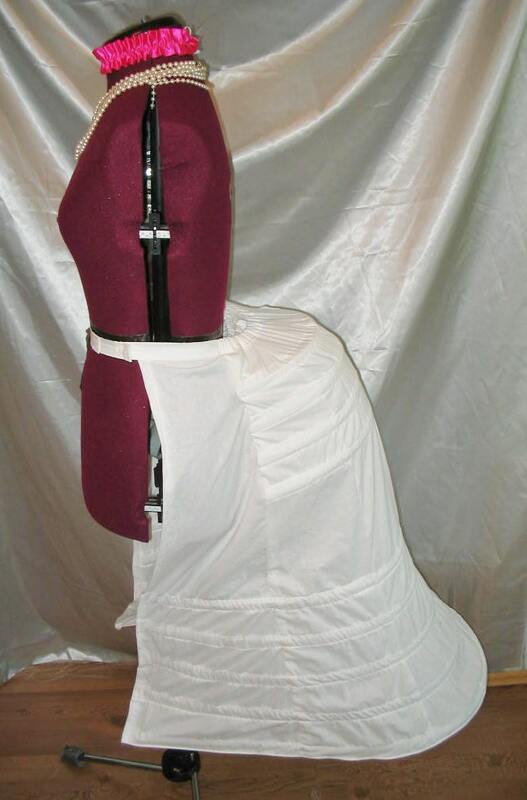 This Victorian bustle cage frame is custom made by me to fit your size. 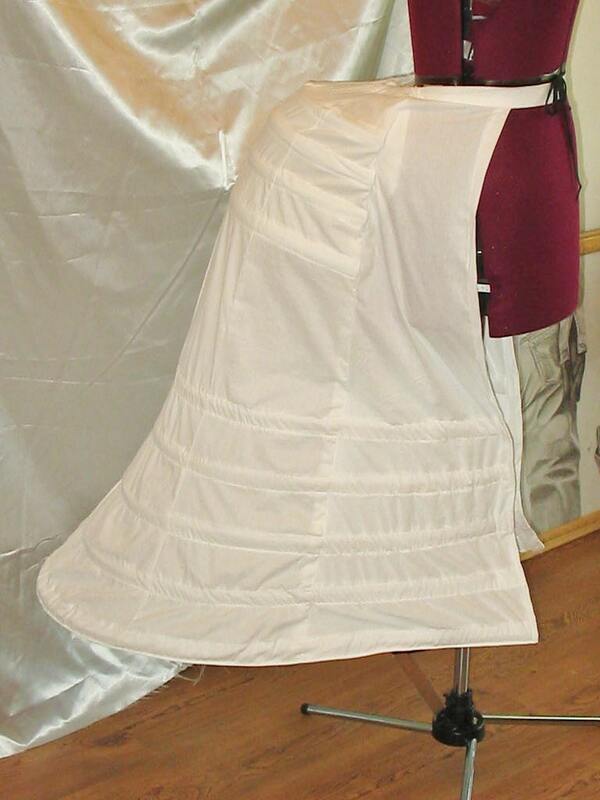 The bustle cage is designed to shape your Victorian bustle dresses at the back. This bustle cage also provides train support by pushing your beautiful trains out back for lots of drama. 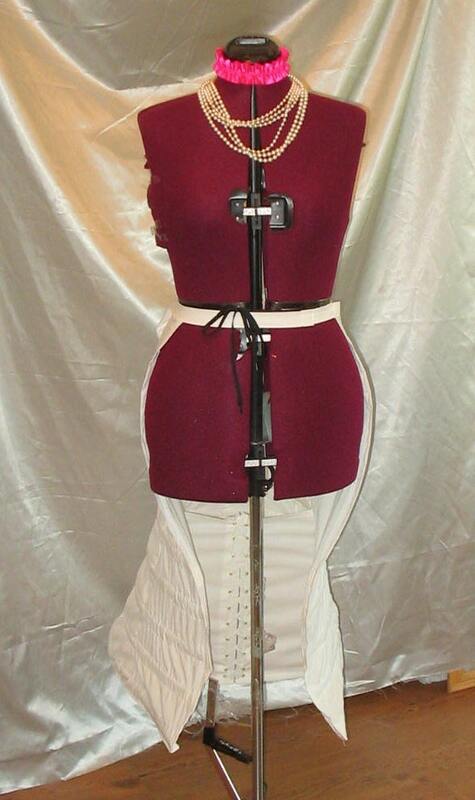 I make the bustles in all sizes...from a 24 waist to a 52 waist. The bustle cage has half inch hoop steel boning in casings. Panels called stays have adjustable ties that control the amount of curved projection at the back. 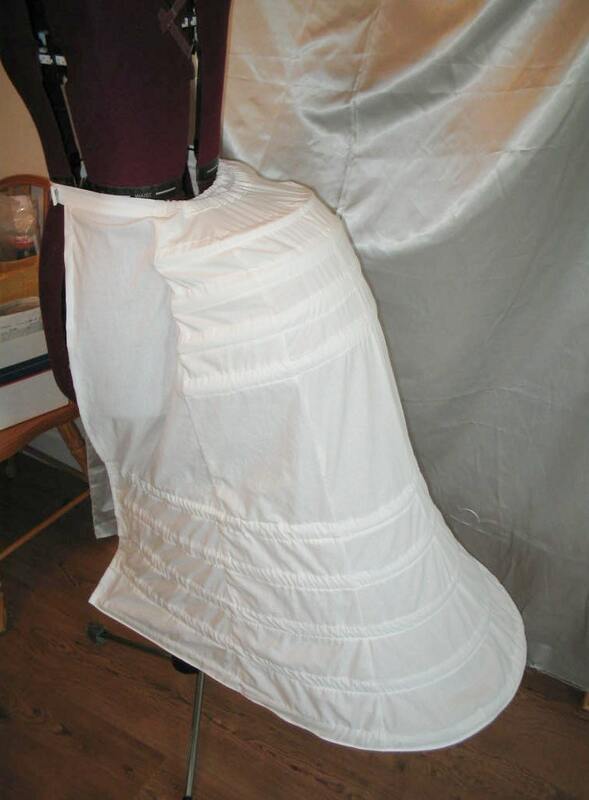 White cotton muslin is the fabric used. Please email me at rhondagr at gmail.com for questions. I answer all questions within 12 to 14 hours.I can combine shipping for multiple items at a lower rate.Please contact seller with your questions. I had art history classes.... became intrigued by the engineering techniques used by the clothing designers of the 17th, 18th,and 19th centuries.... started sewing during childhood..... made custom designs to help support me during my college years. I continue to hold a fascination for the historical clothing periods, while enjoying the creative process. 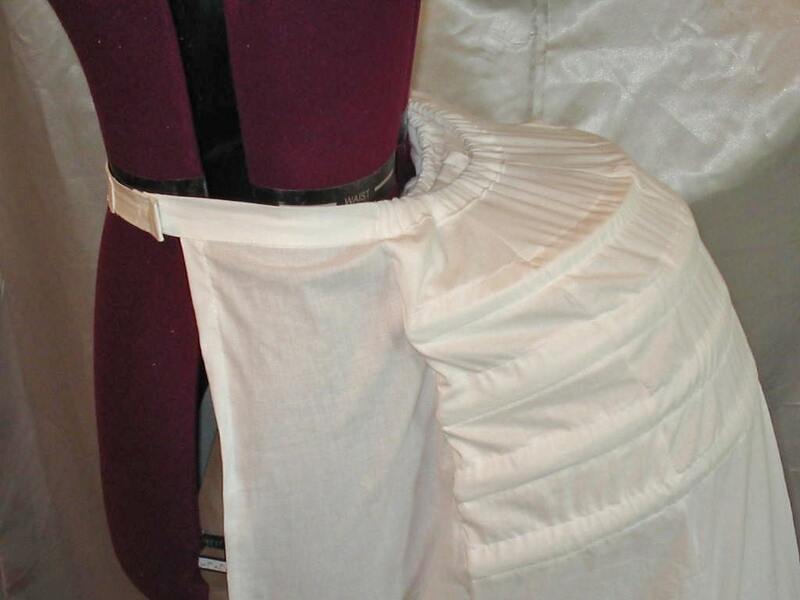 Please allow 7 to 10 business days after payment for custom making and shipping the bustle cages and panniers. I ship United States Postal Service in the USA and Worldwide. I also ship United Parcel Service in the USA and Worldwide. You can process payments with all major creditcards and debitcards from this website. You can also use Paypal to process all major credit cards, debit cards, bankcards. I also accept USA checks and USA Postal money orders. All international orders must use creditcards or Paypal. When processing Paypal payments, you will be temporarily transfered to the paypal website. store. If you have further questions please convo me.Please shop with me again. Thanks much, and a wonderful year to you and yours. Showbelles is a true handmade shop. Items are not outsourced to an outside company. Please be advised that custom items, made to fit your size apparel, are non-returnable. Be sure to have accurate measurements. If you need help with measuring , I will send you a measuring doll sketch. The doll sketch will show you exactly how and where to measure. I began marketing made to fit custom items on Ebay in 2005. I have 999 positive 100% ebay feedbacks. With proper accurate measurements, I can build orders for women,men and children over dress forms set to your size and measurements. The key to getting a good fitting custom item is sending the correct measurements. Let me know if you have questions. Thanks for shopping at Showbelles. Showbelles items are all custom made, and made to order. All listings have the needed measurements in the descriptions. Please see the list below for sizing. 1. I make all sizes from 34 bust to 52 bust for women. 2. For men, I make all sizes from 38 shoulders to 52 shoulders. 3. I can also make childrens' sizes from a size 7/8 and higher. Let me know if you have more questions about sizing. Convo me through etsy convo. Thank you for shopping at Showbelles on etsy. Some of my custom items are washable in cold water with biodegrable detergents like Woolite. some of my custom items need dry cleaning. 1. Any item made from pure silk will need dry cleaning. 2. For polyester and poly blends, I highly recommend dry cleaning for holding the crisp new look. some polyester garments can be cool water hand washed. No dryers. Lay flat to dry. Very warm iron. 3.Cotton and cotton blends can be handwashed cold water. Cool dryer or tumble dry on very low heat setting. I highly recommend dry cleaning because all of my custom items are special occasion. Each listing will include the care instructions for each item. Let me know if you have questions. Convo me. Thanks for shopping with showbelles on etsy today. When I began selling my custom creations online, I kept the costs down to a minimum, without sacrificing quality, and service. Over a short period of time, several Showbelles buyers recognized they were simply getting high quality, a great value, stellar service, all at a reasonable price. How? I managed to keep my overhead costs down very low. My items and offerings are reasonably priced. I can offer reasonable discounts for qualified orders. Convo me to discuss a discount for a qualified order. A business guru once stated that it is rare to get extremely low prices, high quality, and great service all in one transaction. Thanks for shopping at Showbelles on etsy today. If you need gift wrapping services, please let me know. I do not charge extra for gift wrapping. If you are purchasing a gift item, please have the giftee to contact me regarding accurate measurements. You can also purchase an etsy gift card, and allow that special person or loved one to select the item(s) of their choice. Thanks for shopping with showbelles on etsy today.